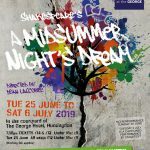 Shakespeare at The George celebrates Double Jubilee! Looking for something to do? Have a peek here! Dan Bryant is our Competition Winner! What’s new to your shopping in Huntingdon?